Home » Life & Society » Why is Islam's poster boy Zakir Naik taking moderate Muslims back in time? Why is Islam's poster boy Zakir Naik taking moderate Muslims back in time? Dr Zakir Naik is a bag of contradictions. A medical doctor who preaches Islam. Effortlessly quoting from the Quran, the Bible, the Bhagavad Gita. Pushing forth his viewpoint with panache in fluent English. In a Western suit worn with a white skull cap just so the symbolism isn't lost. Seeking to clear misconceptions about Islam with reason and scientific facts. But the end result is garbled messaging that contradicts and confuses. That carries forward his agenda. That sounds progressive but comes with conservative caveats. That takes moderate Muslims four steps back. 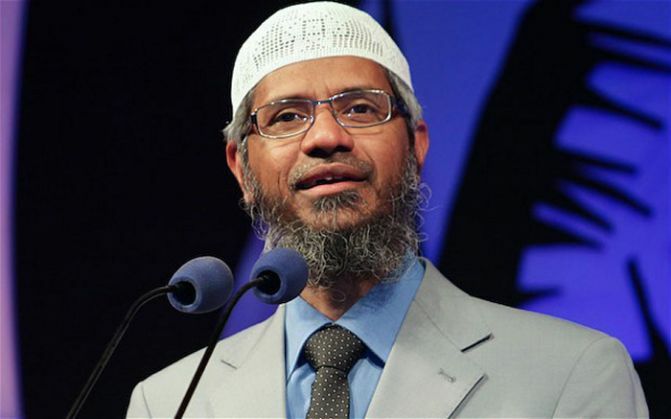 In the 16 years that Naik has been Islam's wonder boy, winning awards, travelling the world, delivering lectures - his rhetoric has widened the gulf between Muslims and "non-Muslims" (as he likes to call them), accentuating the differences between cultures and communities, alienating Muslims from the mainstream. Unfortunately, for most educated Muslims in India and across the world he is the moderate face of Islam. The last word on Islam. An Islam they strive to embrace. In a lecture delivered amid much fanfare in Malaysia this year on Islam, Terrorism and Jihad, Dr Naik did not use his influence to tell Muslims to stay away from violence. Instead he dissected the word, extolling Muslims to not let words such as "terrorist", "fundamentalist" or "extremist" affect them. He blamed the media for maligning Islam, saying it is the most important weapon in the world that "can convert day into night, hero into villain". 1) After 9/11, thousands of books are being published to defame Islam. 2) Muslims are being labelled as fundamentalists. The word was originally coined to describe Protestant Christians. The Oxford Dictionary revised the meaning to describe people who stick to the fundamentals of a religion, especially Islam. 3) I am a fundamentalist Muslim and proud to be one. Because I know, I follow and I strive to practice the fundamentals of Islam. 4) Muslims are being called extremists. Why should Muslims go on the defensive? I am an extremist. Extremely honest, just, kind. 5) Muslims are being called terrorists. For a robber, a policeman is a terrorist. Those who fought the British were terrorists, but to Indians they were patriots or freedom fighters. 6) Bhagat Singh was a terrorist for the British. For us, a patriot. We did not agree with the British then. Why are we agreeing with them now (when they call Muslims terrorists)? 7) When British ruled America they called George Washington Terrorist No 1. He went on to become the first President of the US. 8) Nelson Mandela was also Terrorist No 1. He eventually won the Nobel Prize for Peace. 9) The most misunderstood word in the world is jihad. The word has been derived from "jahada" which means to strive, struggle. A struggle to make society better. 10) The best jihad is to struggle and strive to spread the message of the Quran to non-believers. Prophet Mohammed's first wife was a businesswoman and the Prophet was her employee. 1,400 years later, Dr Naik expects the impossible; he calls the intermingling of opposite sexes a sin. He declares that women cannot talk to men. They have to observe the purdah of eyes, tongue and clothes. In a lecture posted on YouTube he mimics a conversation between a girl and a boy. The girl seeking the boy out. The girl asking the boy to sleep with her. The girl, the devil. "You have to prevent people from feasting on you. If someone steps out in 'deep neck and mini short' (sic) then who is to blame?" "Taali donon haath se bachti hai (you need two hands to clap). So both are responsible for the consequences." Muslims to walk the extra mile to spread the message of Islam, to spread Islam, says Naik - conveniently bypassing the texts and hadiths (sayings of the Prophet) wherein Muslims have been encouraged to coexist peacefully. One of the most important Surahs of the Quran, one most Muslims know by heart, reads "To you be your religion, and to me my religion". 1) Conveying the message of Islam is a fardh (compulsory) on all Muslims. 2) Surah Asr is enough guidance for humankind and states that if a Muslim does not convey the message of Islam to non-Muslims they will not go to jannah (heaven). 3) Islam is the fastest growing religion in the US. 4) After 9/11, 34,000 Americans and 20,000 Europeans accepted Islam. Most converts are women. Modesty is not a virtue that Dr Naik seems to have absorbed from Islam, even though the religion itself treats it as a much-valued asset. He brags about a conversation he had on landing at Los Angeles airport with a customs official and how he shut up the officers with his 'smart' answers. He routinely brags about his "popularity" and how well he does "dawah" (spreading Islam). Traditionally, Islam says the right hand should not learn about the goodness done by the left hand. But that is not the Islam that Naik seems to practice. Or wants his followers to. If one thing is clear, it's that what is wrong with Naik is not caused by Islam. Just as what's right with Islam will not find its legitimate spokesperson in him.